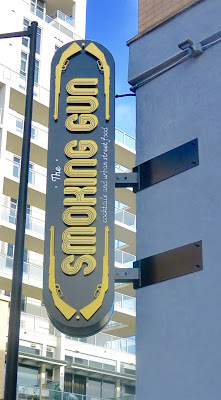 The Smoking Gun - San Diego Dining Dish! Unless you are living under a rock (and sometimes, I quite like it under my rock), you've surely heard of Barleymash downtown. 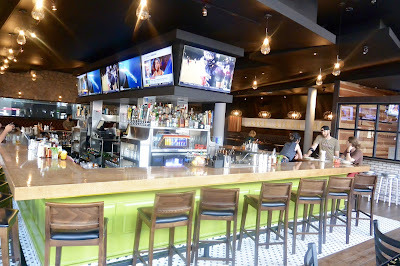 It's pretty much THE bar downtown for the best food and drink -- whether watching the game, dancing to tunes, or just hanging out, barleymash is the just the best place. 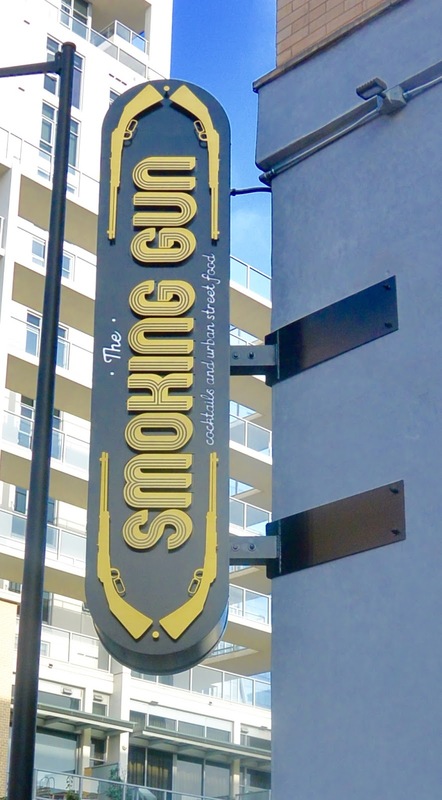 The Smoking Gun is the newest restaurant from the barleymash team, serving up more of the signature comfort food and hand-crafted cocktails to the Gaslamp. The Smoking Gun has a lot more cheek -- you'll find wacky decor and unabashed foods. Check out the bathroom signs! The theme of the place is nostalgia. What made us happy as kids? What's a throwback to a simpler time? 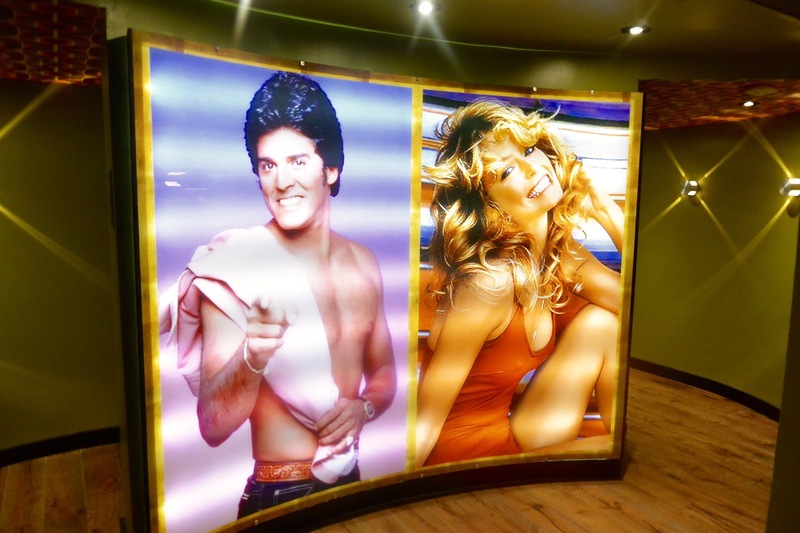 It's tough being an adult, and sometimes, it's absolutely amazing to be able to just kick back and remember the easier times when Ponch was the heartthrob (he still is) and music was on a cassette. 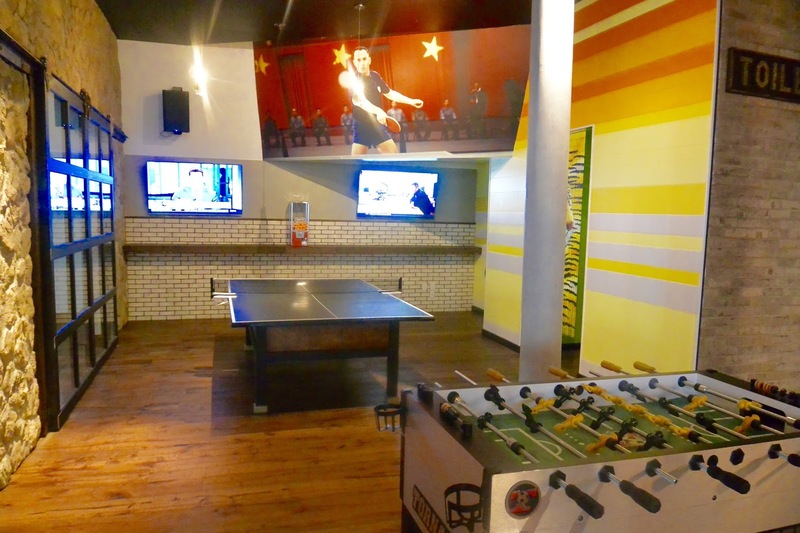 The bar is outfitted with fooseball, ping pong, and a chill living room set up. 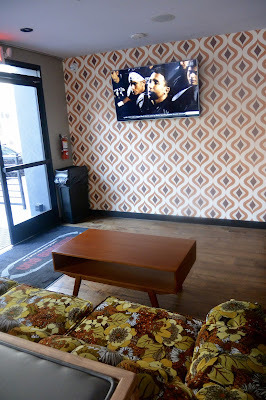 Of course, the bar is designed with gorgeous clean lines and big TVs to see the game. 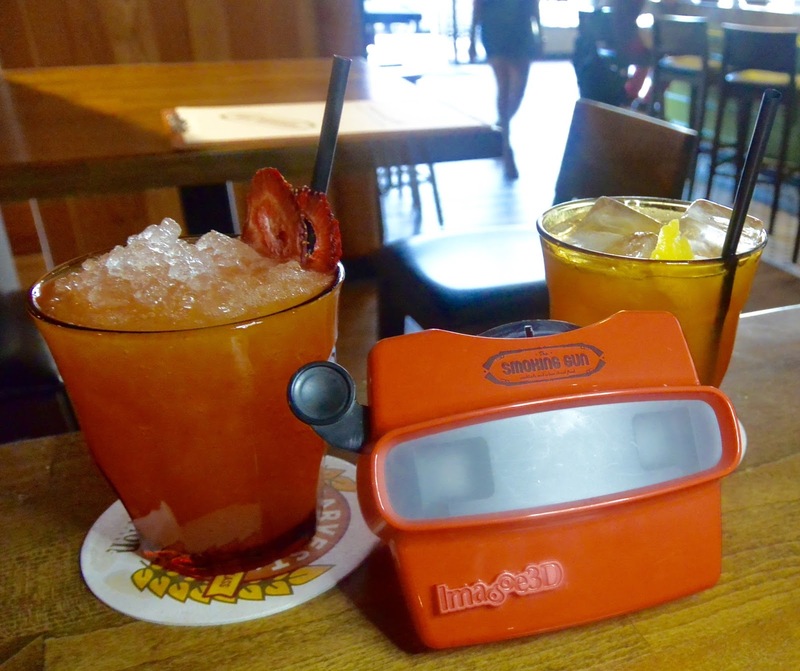 Referring back to the retro theme, how cool is the Viewmaster featuring pictures of the cocktail menu? I love this idea, because it's just a fun way to order, but you also get a visual representation of the drinks. We ordered two of their seasonal cocktails -- The Golden Girls and the Trick Photography. I ordered the Golden Girls for the name alone, but it was a really delicious blend of Wild Turkey, honey, lemon, and walnut bitters, so I'd order again because it was so good. The Trick Photography was very refreshing, featuring tequila, lemon and raspberries. I'm from Appalachia, so of course I love the menu at Smoking Gun. It's composed of Southern comfort foods and everything is homemade. Executive Chef Kevin Templeton is at the helm, and if you've ever had any of his barleymash menu, you know that you're in for some culinary wizardry. We started with some of the cornmeal fried heirloom tomatoes. 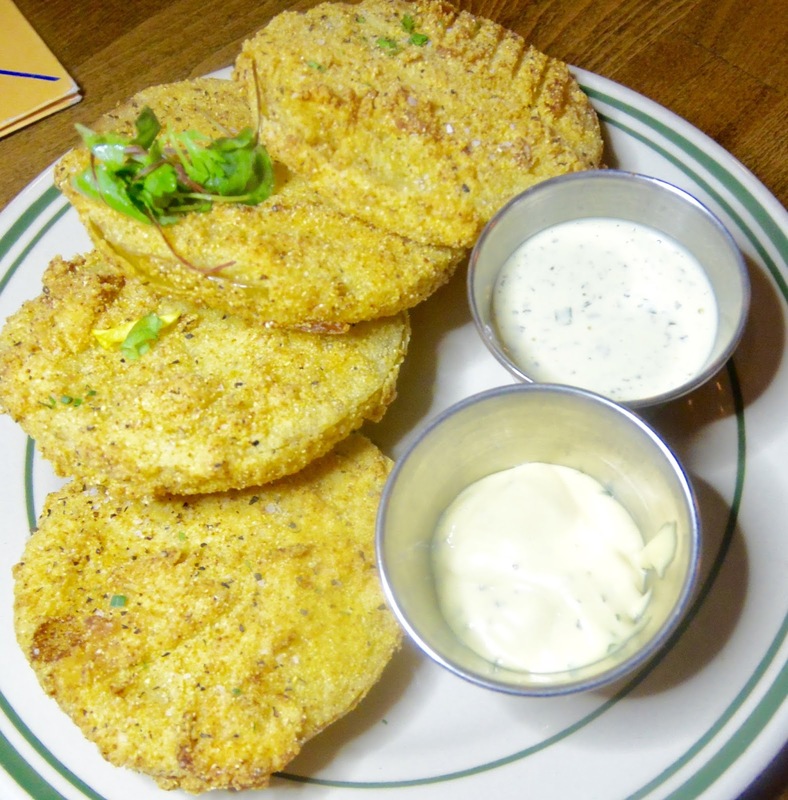 I love fried green tomatoes, but I'm pretty picky about the preparation. The tomatoes should be sweet and have some chew, not slimy and ripened. These were just that -- big, thick slices of fresh heirloom tomatoes lightly coated with a cornmeal mixture, then fried and served with homemade aioli and Chef's famous homemade ranch dressing. I am unashamedly a huge fan of ranch, and I love, love this ranch dressing. The menu isn't broken up into traditional apps, entrees, etc. It's more divided into meats, sides (all of which are vegetarian! ), and salads. It's advisable to just order a load of stuff that looks good and to share with the table (or not if you're protective of your food). The Brandt Farms brisket is pictured to the left, and it was honestly some of the best brisket that I've ever had! It was so well seasoned, and the flavor was just pure bliss. 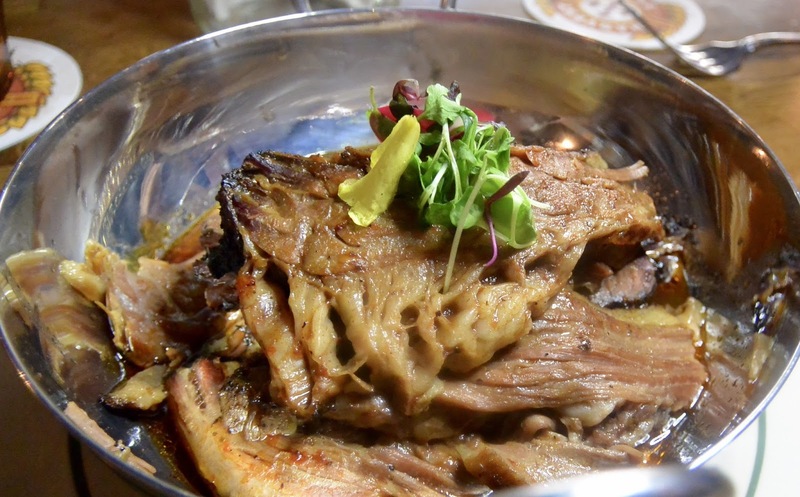 The beef was so tender, it was like meat falling off the bone -- except there was no bone. 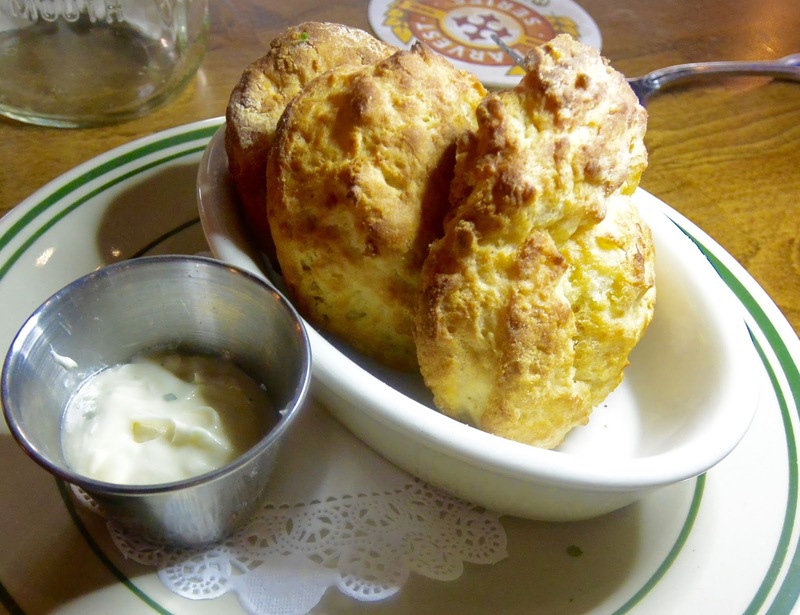 Steve cannot resist biscuits, so of course, we had to taste these staples of Southern food. I'm from WV, so I know biscuits, and I never thought that I would have such delicious biscuits in California of all places. So buttery and soft -- these are great for making a little sandwich of your brisket if that's your thing. 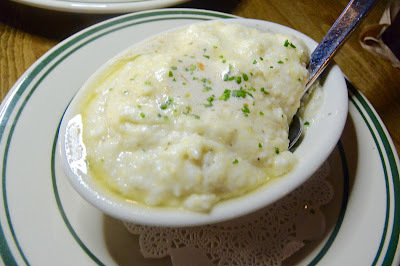 We were both blown away by the white cheddar grits with habanero butter. They were some of the most tasty things that I've eaten, with a sneaky spice from the habanero. Don't worry if you're not into spicy, they can not put the habanero butter on the grits, but I strongly suggest that you try them with the spicy butter! It really puts a new flavor into an historic Southern food. I hardly ever order chicken in restaurants, it just seems like home-y food to me, since we eat so much of it at home. However, I had a feeling that the lemon herb chicken with homemade barbecue sauce would be amazing, and I was not wrong. 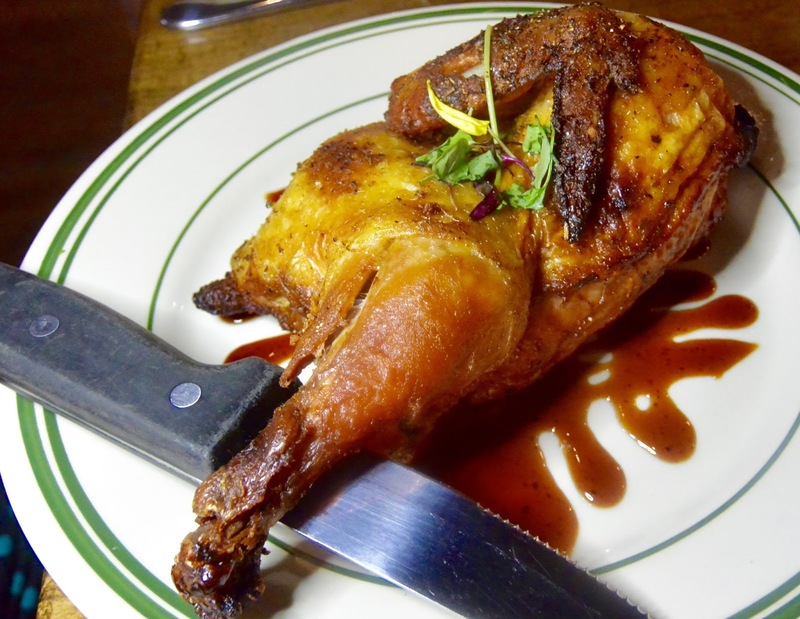 Served as a full half of a chicken, the chicken is press and roasted with lemon herb seasoning, then served with the sauce. Dip it in that sauce! It's good for you. Who didn't grow up eating mac and cheese? Except this mac and cheese is homemade, with more cheese than my mother ever put in it. Actually, my mother always made the Kraft stuff, so never mind. I've a huge taste for any homemade mac and cheese, but I'm a bit wary of chefs constantly messing with it, adding lobster, bacon, Pop Rocks (yes, really). 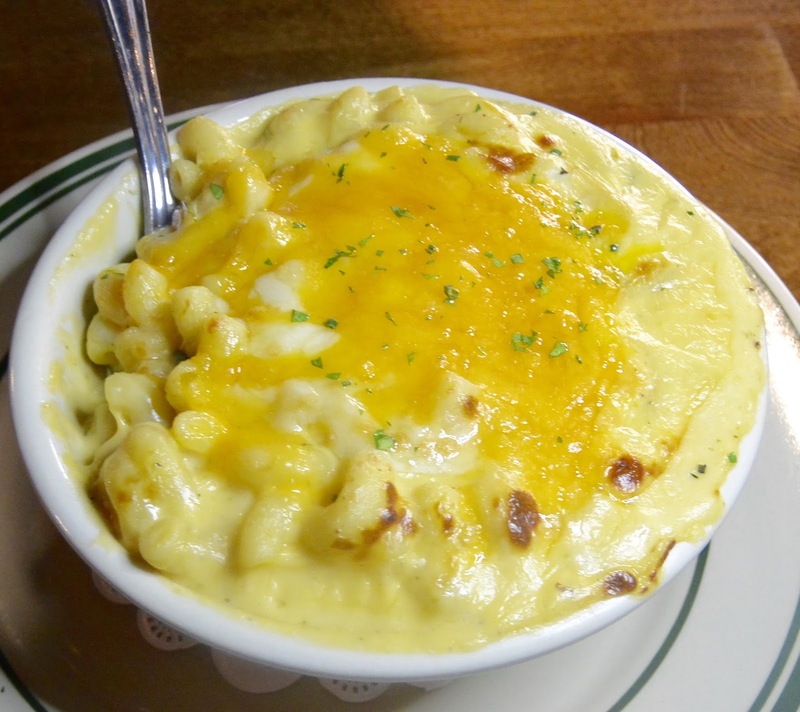 The mac and cheese at Smoking Gun is just a simple, cheesy masterpiece. As with all of the sides, it's vegetarian, and so creamy and cheesy that I didn't want to share. More cocktails were ordered, since I had to look at that Viewmaster again. Pictured are the Peach Pit, as seasonal cocktail with vodka, peach, and cinnamon. Sweet and refreshing, and a wonderful presentation. 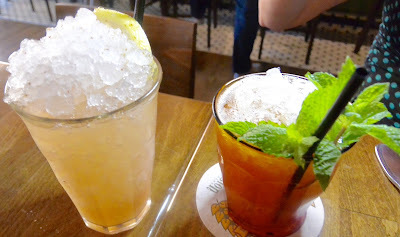 The other drink pictured is the signature cocktail, The Smoking Gun, with Famous Grouse scotch, Laphroaig, lemon, and mint. I'm not much of a scotch drinker (my wallet thanks me), but this drink was absolutely delicious! I might be a scotch lover yet. Our last taste of the night was the homemade stuffing with mushroom gravy. Again, this item is completely vegetarian, and I swear, you will not miss the meat stock or oysters. 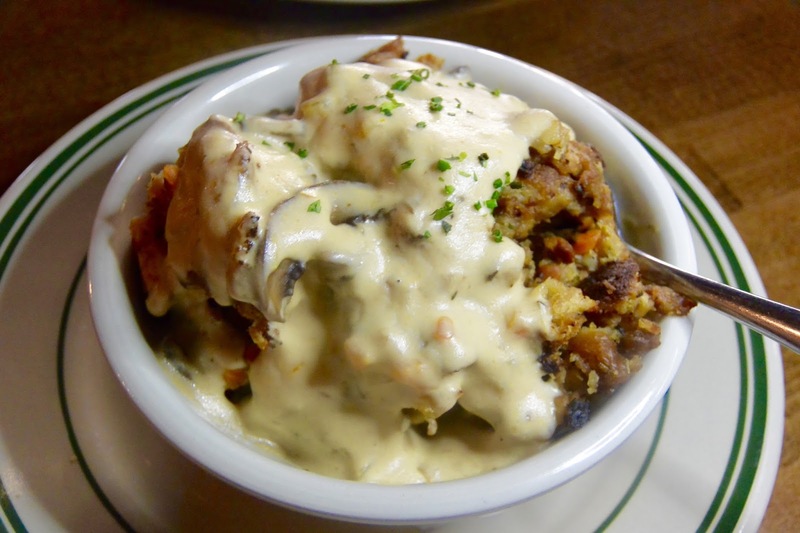 It's so flavorful even without the mushroom gravy, but the gravy is the best! I highly recommend giving this item a try, even if it might seem like something that you would never order in a restaurant. It's so good! 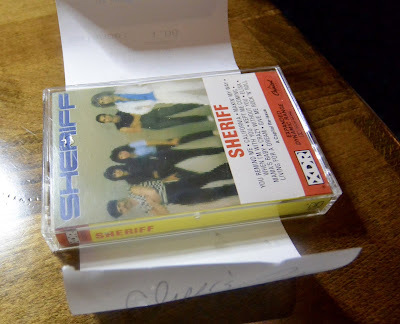 Remember earlier when I mentioned music coming on cassettes? Well, the check presentation comes in a throwback cassette case featuring some of the most cheesy awesome bands of the best decade -- the 80s. I loved this place. 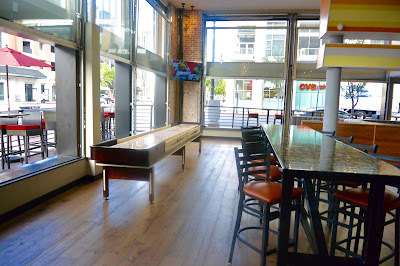 It's a great concept, and just like its big brother, is sure to please everyone.